It’s so easy to forget that technical writers are still writers, too. Though they don’t write “traditional stories”, or adopt the “writer” title when doing it for their career, they do still write. They tell us “knowledge stories”, you can say. In that sense, it’s just as important to help technical writers in the way that we support our creative storytellers. They don’t support us. They actually seem to look down on us storytellers. Sometimes, this is the case. Academic, freelance, and technical writers are more apt to get paid for their writing because it’s “needed”, in a way. Not only that, they’re held to more strict expectations than creative writers. You think we don’t have expectations? Like we aren’t credible? You wish that’s what I’m implying. You notice it says “more strict” expectations. Creative writing doesn’t have “strict” expectations because there is no “right or wrong” way to do it; in technical writing, there is. If you don’t write according to those standards, you’re a lousy technical writer. In creative writing, not doing the “norm” can make you amateur, innovative, eclectic, or any number of other things. Each has a different role but are equally needed. Personally, I’m both. As a professional teacher and blogger, I spend more time writing technical articles and guides than I do creatively writing my stories and poems (I know, I know. I’m traitor). Because of this, I know both sides’ struggle. Don’t believe that the “cold, detached” technical writers feel, too? 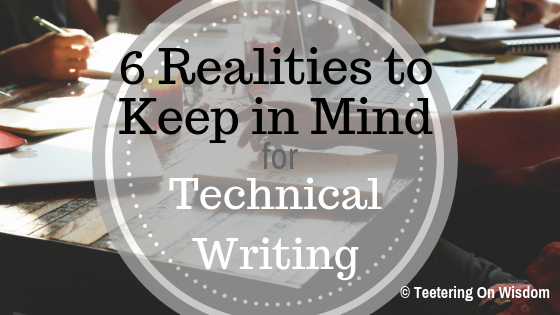 Here are six realities of a technical writer. I don’t represent the outside source links in this post; I recommend them, but do not work for or promote their views. Nor do they mine. Read more about what I mean in the terms and conditions. Everything has to be researched. In the age of (almost) unlimited access to information, it’s expected that you research and reference everything related to your topic before you present to an audience. While this is good–ensuring your info is credible, thorough, and impactful–it also leaves little room for new and emerging ideas that don’t have all the published articles available yet. And, for each article, you better be ready to cite everything you read. Don’t just reference or link to it (like blog articles); legit technical writing has a bibliography on the bottom. Hope you paid attention during those research papers in class. People will criticize and compare. Even if your essay/article/paper/dissertation, whatever you are writing, is informative and objective in nature, it will be attacked. 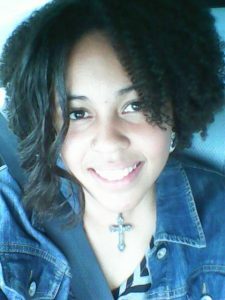 The grad student’s dissertation will be criticized when compared to similar writing by the experience researchers and professors at other universities. Not to mention, anyone who disagrees with your topic will work to discredit your writing ability more than the content you wrote. There are no bystanders or helpers in the technical world; everyone’s either a “victim” or “perpetrator”, “supporter” or “traitor”. The writer is very scrutinized. Because technical topics are usually subject to disagreement, writing is not the only credibility qualification. As it typically should be, the writer’s background and accolades heavily credits and discredits an author–no matter what (s)he writes. The good thing about it: our information is of better quality and valid. The downside about it: no matter how good the writing is, the author’s background can discredit the topic; plus, credible writers can write almost anything they want, and their accolades will deem it credible–even if it’s not. Scary, right? There’s no room for loose ends. Need another way to lose credibility? You can easily do so by being biased and addressing only one side of a topic. This happens A LOT. It feels so normal to see such that people accept it as okay. It’s not. Quality, valid, credible writing will not make a statement unless all sides are addressed. You need to be well researched and well-informed. If you cannot defend your side while presenting the others, your side may not be as well-thought-out or valid in comparison. While one biased article can start a riot, it’s not enough for a revolution. Follow the “good writing” rules. While there are suggested, good writing rules in fiction and nonfiction, technical writing has no suggestions. It has rules; follow them. There are certain ways to write quality work that allows readers to better understand, skim through, and reference. Anything other than this is amateur and not credible. What’s lovely is you can find most of these rules anywhere on the internet from credible sources–like Purdue OWL. While creative writing has more room for variety and engagement, that isn’t the case for technical writing. There is no imagery, there is no figurative language, there is no persuasive voice. Give the facts, leave out all the rest. No uniqueness, no “style”, no nothing but words that make a point. Charlie Brown’s monotonous teachers–yeah, get on their level. Keep in mind: this is for academic and technical writing–not nonfiction. Nonfiction has branched out from technical to have a creative side, now. Actually, it’s almost expected to be a little more creative. Like, textbooks are nonfiction (not necessarily technical) and are more engaging for students than they used to be. 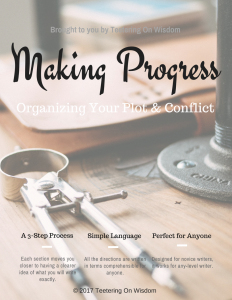 In the creative writing world, competition is based on originality and figurative language; in the technical writing world, there isn’t competition–you are or you aren’t. There are few second chances and in-betweens. Hope your skin is Teflon. If you are one, what it’s like being a technical writer? What are the main differences between nonfiction, fiction, and technical writing in your eyes? Let us know in the comments below, and on social media, of course. And, whether you’re a creative or technical writer, my Writer’s Wisdom newsletter is for you–sign up!